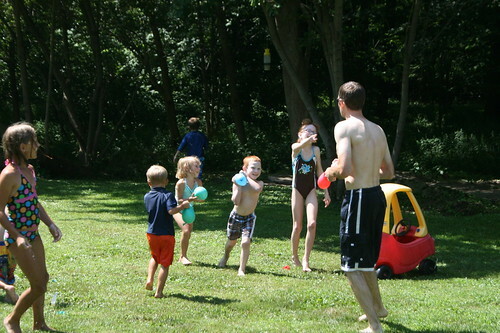 a pinata was beat to death by 13 children, and there was rowdy swimming in the pool. We were also fed dinner and delicious cake and ice cream for dessert. You can't really beat that on a hot sunny Saturday. The best part was Mat voluntarily donated her non-played with Barbies for my niece's present. I think she ended up giving away about 8. That made E. very happy. Mattey is such a sweetie.